Regenerative medicine therapies are creating a new foundation for treating and curing debilitating and deadly diseases that just a few short years ago were considered incurable. The ability of sponsors to bring new advanced therapies to patients has been greatly enhanced by the ongoing implementation of the 21st Century Cures Act (2016). Under the Act, the FDA has taken steps to modernize clinical trial design and create the regenerative medicine advanced therapy (RMAT) regulatory designation. RMAT is a special designation for products that both (1) modify, reverse, or cure a serious or life-threatening disease and condition, and (2) demonstrate evidence of the potential to address an unmet medical need. Under the RMAT designation, a product may receive priority review and potentially be eligible for accelerated approval. A related FDA breakthrough therapy designation also expedites the development and review of products that demonstrate the potential for substantial improvement over other therapies. The collective result is a streamlined environment where advanced treatments and medical innovations can be brought to patients sooner and more efficiently. As of August 2018, the FDA has granted 24 RMAT and 39 breakthrough designations, respectively. For product sponsors, this regulatory policy environment is designed to accelerate development programs without altering the standard for approval. Product approval hinges on demonstrating the safety and efficacy of products in clinical trials. RMAT and breakthrough designations may include discussion with the FDA about appropriate surrogate or validated intermediate endpoints reasonably likely to predict long-term benefit. However, the onus then moves to product sponsors to demonstrate benefits. Regenerative medicine trials may be particularly challenging because they often entail considerable operational complexity. This complexity derives from the fact that regenerative treatments are invariably manufactured biological products. Specifically, RMAT designated treatments are, by definition, cell therapies, therapeutic tissue engineering products, human cell and tissue products, or biologics in a combined product. The manufacturing, processing, and delivery of such products to patients tend to require specialized expertise at every step. In addition, our collective experience with cell-gene therapies, biologics, and tissue engineered products is comparatively limited. This limited experience demands rigorous systems for adverse event monitoring and long-term patient follow up. Recognizing this operational complexity and limitations in clinical experience, the California Institute for Regenerative Medicine (CIRM) pioneered the development of infrastructure to support regenerative medicine clinical trials. 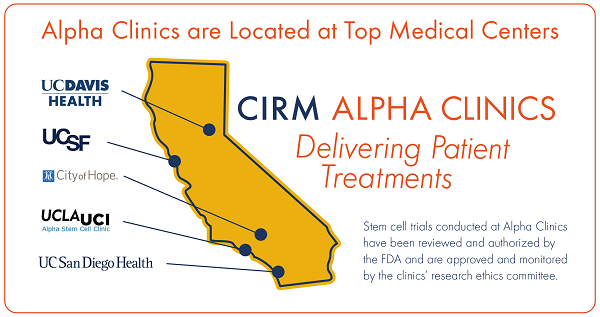 Launched in 2015, the CIRM Alpha Clinics are a network of six California medical centers (Figure 1). The clinics conduct FDA-authorized and IRB approved clinical trials. The aim of the network is to achieve greater and more efficient results than the member organizations could if they acted independently. Each of the Alpha Clinics has formed teams with specialized knowledge and experience with regenerative medicine clinical research involving human cell and tissue products. These teams work across their respective centers. As of September 1, 2018, the network is supporting 49 clinical trials — and has supported 60 clinical trials since 2015 — across a range of indications. Product manufacturing and processing: Each clinic has current good manufacturing practices facilities that handle standard cell processing to facilitate cell therapy infusion. Expert clinicians: The clinics’ directors have expertise in the development of regenerative medicine treatments across a range of indications and therapeutic areas. This expertise further supports clinical trial design and implementation, particularly when specialized clinical procedures are necessary. Experienced nurses: The Alpha Clinics’ nurses combine expertise in cell and gene therapy products and extensive experience running research protocols. This experience contributes to well-controlled patient treatment, monitoring, data collection, and follow-up. Regulatory affairs: Each Alpha Clinic supports a portfolio of investigator-initiated clinical trials. This internal pipeline provides experience with the IND process and associated regulatory submissions. 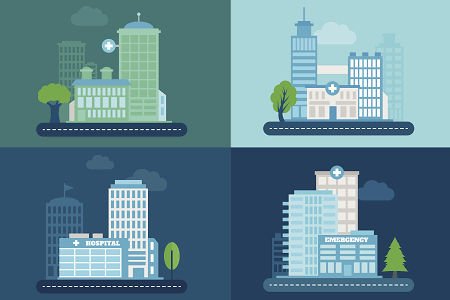 Besides the core competencies of each Alpha Clinic team, the sites regularly leverage each other’s resources and scale their capacities. For example, sponsors seeking to align their product processing and delivery needs to specific patient populations have access to multiple trial sites that tend to enhance enrollment. They can interact with the other Alpha Clinics under a common confidentiality agreement to evaluate the sites that are best suited for their particular trial. The Alpha Clinic teams work across their respective centers to partner sponsors with qualified principal investigators. Other network resources include: cohort identification registries, with over 20 million patients, reciprocal IRB agreements, and enhanced patient educational tools to support an effective informed consent process. This leveraging and scaling of network systems translates into measurable value for commercial sponsors. Engineered immune cell therapies (e.g., CAR-T) for oncology trials are emblematic of this value proposition. Multiple Alpha Clinic sites routinely perform apheresis to isolate lymphocytes. In addition, they operate CGMP facilities for subsequent cell processing, activation, transduction, and expansion. The final product is then infused into the patient. One lesson learned within this network system is that success of this process depends on a specialized supply chain management system. For example, the Alpha Clinic at the City of Hope deployed such a system and averaged 66 patient visits and the handling of 344 biospecimens per month in the first quarter of 2017. The City of Hope Alpha Clinic developed a new management system to ensure effective processing of this volume of biospecimens for the oncology trials. Cell and gene therapies aimed at curing debilitating and deadly pediatric diseases, such as severe combined immunodeficiency disorder (also known as “bubble baby disease”), are also being developed in the Alpha Clinics network. For example, sickle cell disease (SCD), caused by a genetic mutation in the hemoglobin gene, causes red blood cells to "sickle" under conditions of low oxygen. The median survival for patients with SCD is 42 years for males and 48 years for females. By age 20, about 15 percent of children with SCD suffer major strokes and by age 40, almost half of the patients have had central nervous system damage leading to significant cognitive dysfunction. Teams using a combination of gene therapy and hematopoietic (blood) stem cell transplants are treating SCD patients at multiple Alpha Clinic sites. Collaborations between network sites create operational efficiencies by facilitating process development, product manufacturing, electronic medical records, etc. RMAT-designated therapies, including those from Asterias Biotherapeutics, jCyte, and Humacyte Inc., are being tested within the Alpha Clinics network. The Asterias product for spinal cord injury requires specialized neurosurgical techniques to deliver the product to patients. Teams at the UC San Diego Alpha Clinic continue to refine surgical techniques in the conduct of clinical trials, and this knowledge is shared across the network. Fundamentally, this networked environment enables efficient distribution of resources (particularly manufacturing and processing capacity), creation of operating procedures tailored to the needs of RMAT treatments, and a learning system to conserve knowledge and share information across clinical sites. We believe this type of network system is vital to the successful development of RMAT treatments and should be emulated nationally and internationally. Sponsors seeking to develop new treatments should consider the ability of clinical sites to deliver these advanced therapies. Moving forward, it is particularly important to address knowledge gaps and resource needs for the continued acceleration of the RMAT therapies. Regenerative medicine therapies particularly need registries and information systems designed to capture evidence associated with all topics associated with patient management, including, but not limited to, product manufacturing and patient outcomes. A more complete understanding of factors that impact the efficiency and efficacy of manufacturing allogenic cell-based therapies is one example. Such factors may include variability resulting from cell line selection, processing methods, and product handling. Modernizing clinical trial design will necessitate information to validate surrogate markers of effect and real-world patient outcomes. Combining this evidence into robust information systems will inform value assessments necessary to provide for reimbursement of regenerative medicine products. In conclusion, regenerative medicine therapies are treating and curing debilitating and deadly diseases. The FDA’s RMAT and breakthrough designations have created a streamlined environment for product sponsors. To effectively leverage this regulatory policy environment, sponsors must conduct high-quality clinical trials that are often operationally complex. Clinical trial networks, capable of managing the array of regenerative medicine technologies, are well suited to manage this complexity. The CIRM Alpha Clinic network is a current highly functioning proof of the concept. Patients with unmet medical need and product sponsors will benefit from the replication of this model nationally and internationally. Geoffrey Lomax, DrPH, joined the California Institute for Regenerative Medicine (CIRM) in 2005. He is a senior scientific officer on CIRM’s Therapeutics and Strategic Infrastructure team. The team develops strategic assets to accelerate the delivery of treatments to patients with unmet medical needs. Lomax coordinates the implementation of CIRM’s $40 million Alpha Clinics Network. The Alpha Clinics Network sites are located at top California medical centers. The clinics provide a platform to deliver high-quality FDA-authorized regenerative medicine clinical trials. In addition, Lomax coordinates the development of CIRM’s Medical and Ethical Standards and other public policy initiatives. You can contact him at glomax@cirm.ca.gov and follow him on Twitter (@Geoff_Lomax). The author acknowledges and thanks the Alpha Stem Cell Clinics Program Directors Dr. Mehrdad Abedi (UC Davis), John S. Adams (UC Los Angeles), Dr. Daniela A. Bota (UC Irvine), Dr. Catriona H.M. Jamieson (UC San Diego), Mark C. Walters (UC San Francisco), and John A. Zaia (City of Hope) and CIRM Team Dr. Abla Creasey and Dr. Maria Millan for their intellectual contributions and review of this article.